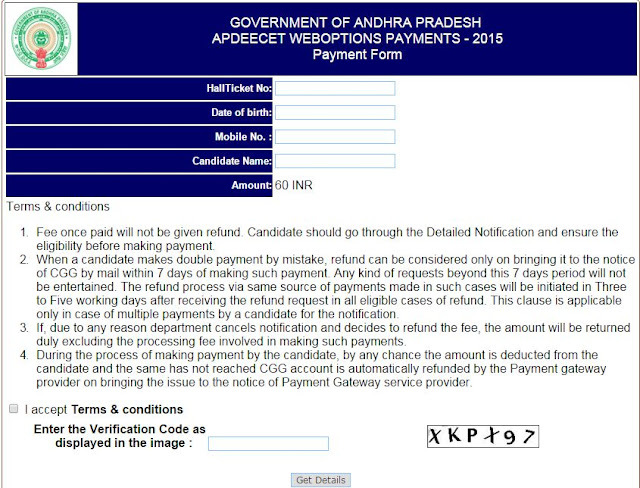 AP DEECET 2015 conducting of web based admission counseling to the rank holders of DEECET 2015 Payment and Web Options. AP DED Admistion's Counseling will be conducted for admission in 14 Govt DIETs & 429 approved private DEd college on receipt of the Governament order Newly afflicated colleges will be included phase - 2 Counseling. There fore the Principal of DIETs in the state are informed to make necessary arrangements in the grade of verification of certificate of the candidate of DEECET- 2015 as per the above scheduled. District Editions of all the leading news papers and also monitor to the process of work in their respective district with the principal DIETs and to complete the process successfully , as per the above scheduled without any deviation. Get Your Payment Option - Click Here. Get Upload WEB - Option's - Click Here.